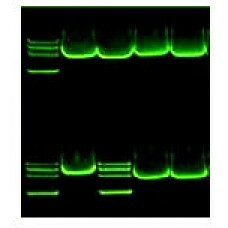 The DNA SafeStain Loading Dye is for running DNA samples on an agarose gel. The DNA SafeStain Loading Dye contains three regular dyes and a safe, non-carcinogen green fluorescent dye. The three regular dyes are for monitoring the agarose gel while it is running, and the green fluorescent dye is to replace the toxic carcinogen ethidium bromide (EtBr). By using this special DNA loading dye, your agarose gel will reveal three different colors; purple, blue and yellow, while running. The gel can be directly visualized under LED or UV light without any extra staining steps. 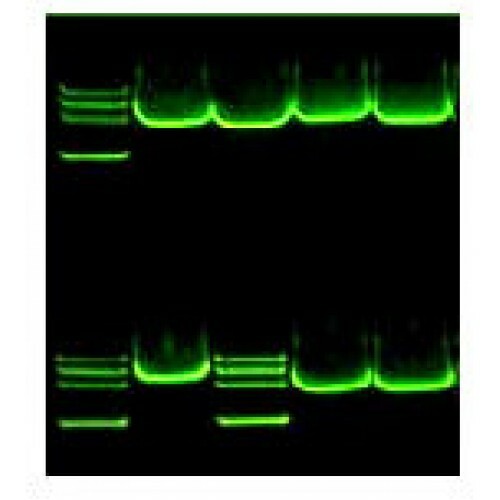 DNA stained with the fluorescent dye will emit a green light (530nm).